There are approximately 580,000 acres of roadless wildlands adjacent to the Selway – Bitterroot Wilderness. These are comprised of Meadow Creek (215,000 acres), Rackliff – Gedney (90,000 acres), Lochsa Slope (75,000 acres), North Fork Spruce (36,000 acres), Sneakfoot Meadows (23,000 acres), Lolo Peak (18,000 acres) and the Bitterroot Face (123,000 acres). The latter two are located in Montana, except for approximately 1,000 acres, which are located in Idaho. Meadow Creek provides the most important habitat for Westslope – cutthroat, steelhead, Bull trout, and rainbow trout on the Nez Perce portion of the Nez Perce – Clearwater National Forests. Located just to east of the Selway – Bitteroot Wilderness, and separated from the Frank Church – River of No Return Wilderness to the south by the Magruder Corridor, this intact, large swath of roadless wildland also supports crucial habitat for grey wolves, wolverines, fishers, black bears, and historically, grizzly bears. Rackliff – Gedney straddles the divide between the Wild & Scenic Lochsa and Selway Rivers, and is adjacent to the Selway – Bitterroot Wilderness to the east. Comprised of steep slopes, weathered ridges, and flower-filled meadows, this roadless wildland ranges from 1,500 – 6,900 ft above sea level. Oral histories and archaeological findings suggest that the Nez Perce routinely traveled through this area and contains important spiritual significance. Lochsa Slope parallels the Wild & Scenic Lochsa River to the south and Selway – Bitterroot Wilderness to the north. The area contains thirteen cold and clean-water tributaries of the Lochsa River, with five of them providing essential habitat for West-steelhead and summer Chinook. This extraordinary landscape also supports habitat for elk, moose, deer, mountain goats, cougars, black bears, lynx, wolverine, fisher and Harlequin ducks. North Fork Spruce lies adjacent to the Selway – Bitteroot Wilderness to the east. Steep, diverse, and wild, the area has a dominant spruce-fir forest canopy and supports one of the largest moose populations in all of Idaho. The wildland also provides important summer range for ungulates, notably elk, and habitat for fishers, wolverines, Columbia spotted frogs and Harlequin ducks. White Sand Creek, with its headwaters located in the Selway – Bitterroot Wilderness, drains this roadless area. 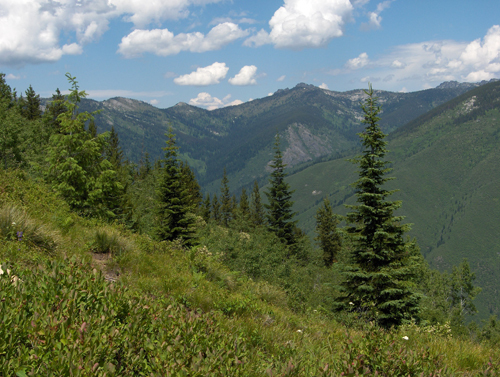 In conjunction with North Fork Spruce, the Sneakfoot Meadows Roadless Area is commonly referred to as Elk Summit. Comprised of jagged peaks, glacial cirque lakes, meandering streams, and wet meadows, this wildland supports lupine and Indian paintbrush wildlfower populations, as well as subalpine fir, grand fir, Englemann spruce, and lodgepole pine. The vast majority of the Lolo Peak and Bitterroot Face are located on the Lolo and Bitterroot National Forests in Montana. For historical, ecological, and geographical reasons, they are logical additions to the Selway – Bitterroot Wilderness. The Selway – Bitterroot Additions are threatened with road building, logging, mining, and more-increasingly, by motorized recreation. Much of these wildlands, including those in Montana, were included in the original Selway Primitive Area, which was drawn up in the 1930’s. For political reasons, these roadless wildlands were excluded when the boundaries for the Selway – Bitterroot Wilderness were established in 1964. The Northern Rockies Ecosystem Protection Act (NREPA) would rightfully add these areas to the National Wilderness Preservation System.